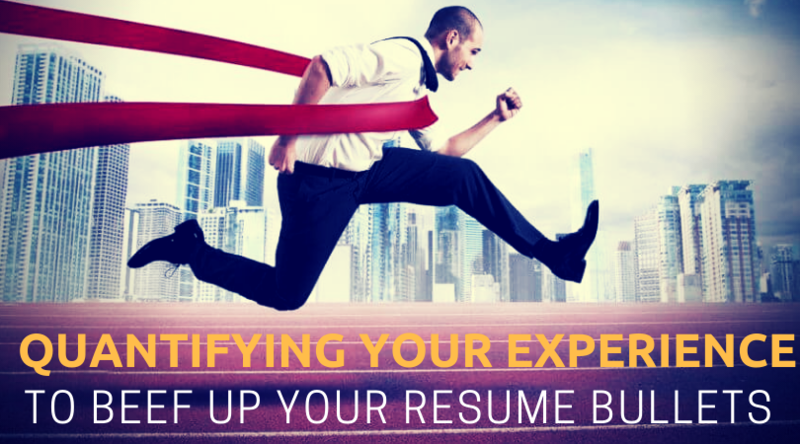 You’ve most likely heard the suggestion to include numbers to your resume bullet points. It helps both Hiring Managers and Recruiters to visualise your key contributions in your current and past roles. If you’re the Hiring Manager, which applicant would you hire? Applicant 1: Accountable for processing employee payroll by collecting, reviewing and organising timesheets in a timely fashion. Applicant 2: Consistently met stringent cycle time of 6 hours to process fortnightly payroll by collecting, reviewing and organising timesheets for up to 285 employees. I know you might be thinking: ‘What if I my work doesn’t involve any figures or hard numbers?’ Perhaps you’re in a role that requires softer skills, such as managing people, preparing reports or responding to customer enquiries. Or maybe you just really don’t have any hard data or sales reports to pull from. That’s absolutely fine! Honestly, whatever work you have in whichever job sector, you can still include some numbers and figures to your resume to give it that extra oomph. Oftentimes, not knowing the exact figures is a big obstacle for using numbers on resumes. But one of the ways to overcome this is to use range. It’s understandable to not know the exact number of leads you call in a month, or how many customer enquiries you handle personally, but that doesn’t mean you shouldn’t still quantify it. Give it your best estimate (without necessary lying on your resume) and the range will show that there is a bit of allowance. Solidify your bullet by mentioning the impact of this task. Before: Responsible for conducting cold calls to promote the company’s telecommunication products to customers. After: Carried out 30-40 cold calls to prospective clients to promote company’s telecommunication products, such as IP Telephony and NBN solutions, which helped establish a healthy sales pipeline. As an elevator pitch, you need to keep your response concise and focused, ideally in between 1-2 minutes. You won’t be able to fit all your greatest qualities into a maximum of 2 minutes, so you’ll have to spend some effort thinking about how to present yourself in a way that starts the interview on the right note. Another easy way to add some numbers is to mention how frequently you do a specific function. This is particularly helpful to showcase your work in high-volume settings, allowing the Hiring Manager to visualise how much you can handle. Before: Conducted first editing pass on articles. After: Reviewed 20-30 customised articles on a weekly basis, and made sound decision to either approve articles for submission to the editorial unit or send back to authors for further adjustment. If you’re more concerned about people rather than figures, you can add the number of people you’ve managed, discussed the project with, or worked for. It’s similarly important to make your resume highlighted by showing that your contributions have a real world impact. For example, if there are people who have benefited from your project, make a mention and keep them counted. By this way, it shows that you’re not just spinning the wheel art work but working for some motive. Before: Responsible for leading the promotional union of students. After: Oversaw a promotional union of 15 members, as well as presented a marketing strategy to an audience of 50-70 students at a weekly university meeting. Before: Migrated exchange portals on Linux Platform. After: Project managed the migration of exchange portals on Linux Platform, which served approximately 10 major universities with circa 15K students and faculty member per institution. Employees who are bold and push beyond the status quo are the ones Hiring Managers are looking at eagerly. Hence, it’s good to mention about the advances you’ve made in your current or previous roles in terms of percentages. The decrease in cycle time, increase in production, and the percentage that you’ve saved by your excellent project executions can be mentioned on your resume. Before: Implemented an automated system for submitting timesheet and leaves. After: Streamlined timesheet and leave submission procedure, which eliminated manual and laborious process and in turn slashed cycle time in approval by circa 20%. Another way to quantify your experience on your resume is by including the awards and recognitions you’ve earned, the reason why you were recognised, and the number of other individuals considered for this award. Before: Received CEO Award for surpassing quarterly target. After: Ranked #1 out of 150 Sales Managers in the region, and was recognised with CEO Award for surpassing quarterly goal of $1.5M which was the largest sales quota in region of up to 50 stores. If you can only think of 1-2 number statements on your resume, just add them to the job position, under the experience section. On the other hand, if you have more than 3 accomplishments, consider creating a separate ‘Key Accomplishments’ section, following the ‘Core Competencies’ or ‘Key Skill’ section of your resume. Click here for our free downloadable resume template. By this way, you’re able to grab the attention of the Hiring Manager and he continues to read. A resume can be quantified in the manner which can be followed as mentioned in the above tips. Figures and hard data make a huge difference on resumes irrespective of what work one does. It’s important for job seekers to polish their resume by supplementing few numbers to quantify their work. By including numbers, you’re able to form a picture in the Hiring Manager’s mind.